PIN/PENDANT. SARAH COVENTRY. "ADAM'S DELIGHT" FROM 1961. 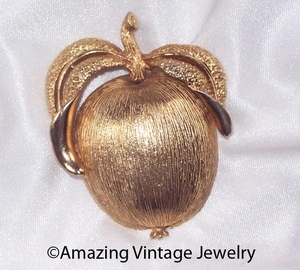 SIMPLE AND CLASSIC TEXTURED GOLDTONE APPLE TO WEAR AS A PIN, OR ADD A CHAIN TO CREATE A NECKLACE. 2 5/16" LONG, 1 3/4" ACROSS. VERY GOOD CONDITION.